Don't ask how this got started; it's too strange for explaination. 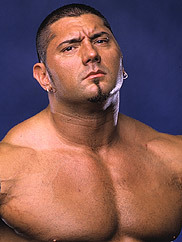 Just sit back and please understand that big muscley WWE SuperStar Dave Batista is the subject of the second elphotoShop this month. I wasn't even that sleepy this time.